The Hole-in-the-Rock trail narrative is more than men and women colonizing a new area. It is the “can do”, or as Jens Nielson would say “stickie-ta-tudy”, attitude of the American pioneer. Settlement of the San Juan country is a fitting epitaph to the determination and the perseverance of American colonists throughout America’s westward expansion. The uncompromising determination of these settlers was exemplified by the leader of the Cedar City group, Jens Nielson. A member of the Willey Handcart Company, the rescue party did not have shoes big enough to fit his rag-bound feet. Struggling over Rocky Ridge, his feet froze to the point he could go no farther. Jens dropped in the snow and begged his wife, Elsie, to leave him. Without hesitation, the less than one hundred pound Elsie loaded Jens on the handcart and pulled him the rest of the way to Rock Creek—in history, the man is usually given all the credit, but in this case and countless others without Elsie there may not have been a Jens. Bodil Mortenson cared for young Jens Nielson Jr., while Else pulled his father in the handcart. When Bodil reached the camp, she gathered sage for a fire. Exhausted from the ordeal of Rocky Ridge, she leaned against one of the cart wheels to rest. She died–the sage still in her hand. Bodil and Jens Jr. are buried at the Rocky Ridge gravesite. 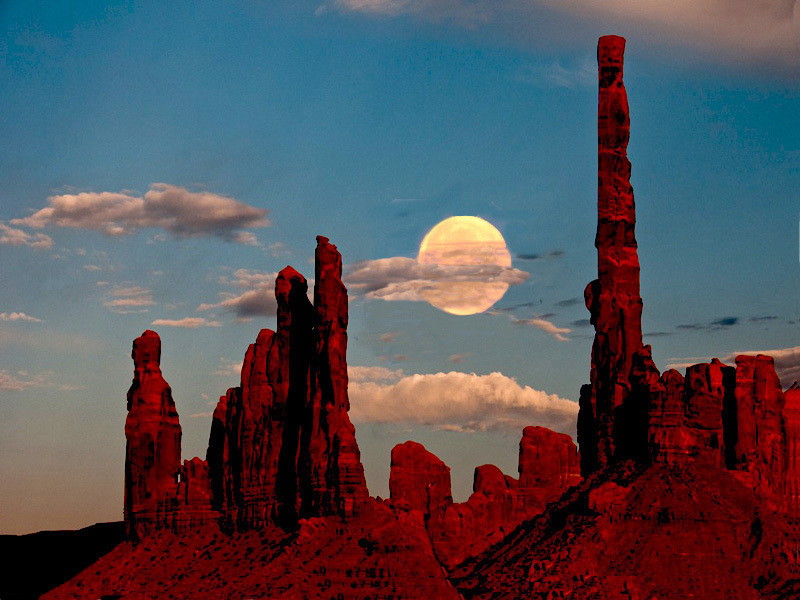 The Mormon Church wanted to settle the San Juan area in part to protect southern Utah settlements from non-Mormons, outlaws, and to create better relations with the Indians. April 13, 1879, Silas Smith and an exploratory party left Paragonah (near Cedar City, Utah) to blaze a trail to the four-corners area of the San Juan River The exploratory party consisted of twenty-six men, two women, eight children, eight wagons, eighty horses, and sixty-six head of cattle–two of the members were Jens Nielson’s son Joe and his son-in-law Kumen Jones. The two families with the party intended to settle on Montezuma Creek just above where it emptied into the San Juan River. The Smith party crossed the Colorado River at Lee’s Ferry. After crossing the Colorado, Smith lost a third of the cattle before reaching the Moenkopi Indian village. 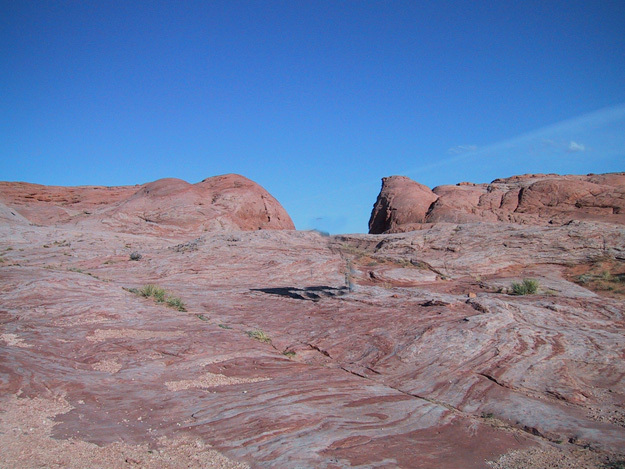 The Moenkopi Indians informed Smith wagons could not reach the San Juan River area from there. The rough terrain had little forage and water, but it did have spectacular beauty in some areas. Smith left the cattle and the Davis family at the Moenkopi Indian village—Mrs. Davis was expecting a baby within a few weeks. After reaching Montezuma Creek, four men went back after the Davis family and the cattle. While the men were gone, the rest of the men built two cabins and worked on irrigation ditches for the Harrison H. Harriman and James L. Davis families. The two families planned to stay on Montezuma Creek. Five other families were located not far away on McElmo Creek—four of the families were non-Mormon. The Smith party left Montezuma Creek and headed north towards Moab. 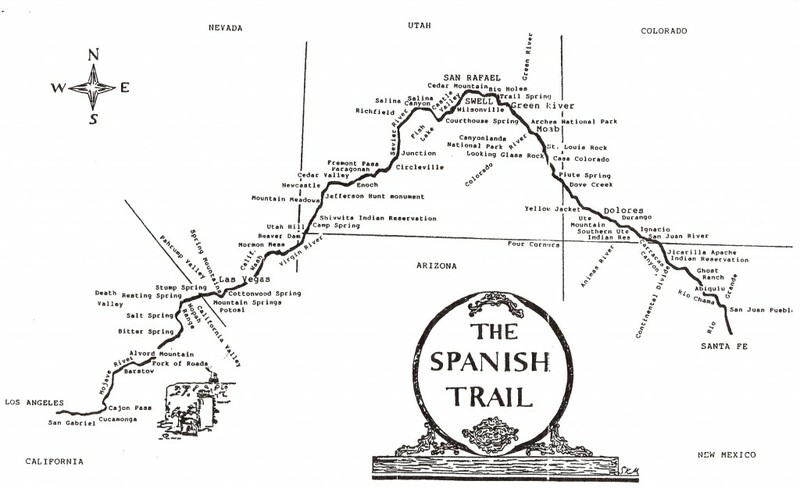 They found the old Spanish Trail at the edge of the LaSalle Mountains, and followed it back to Paragonah. The Smith Expedition had taken five months to travel over one thousand miles—roughly five hundred miles either way. With a favorable report, the San Juan Mission was established, but it was decided to search for a more direct route. 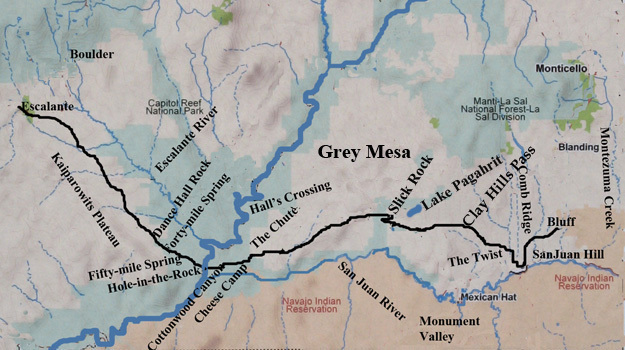 Charles Hall of Escalante was sent to find a wagon route to the Colorado River. 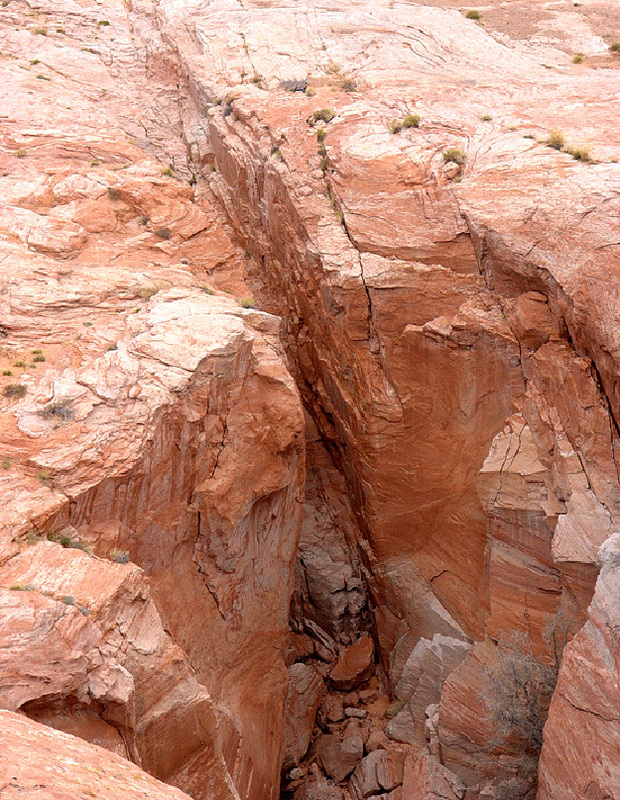 Fifty-five miles southeast of Escalante, Hall found a narrow cleft in the canyon rim. 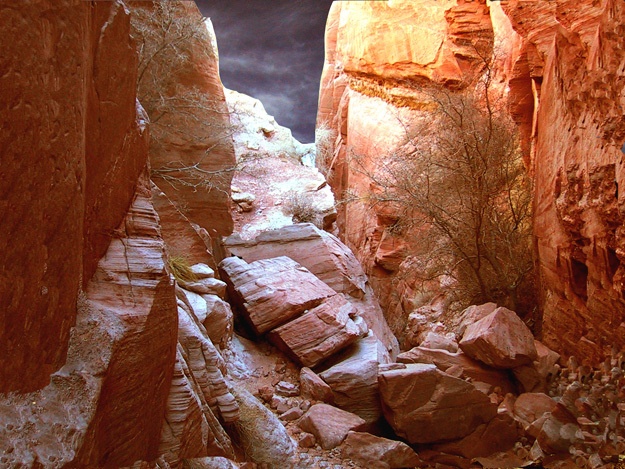 Charles Hall reported to Church Authorities he had found a fissure in the canyon wall that widened into a series of steep benches to the Colorado River. He estimated the distance to the river as three quarters of a mile with a two thousand foot drop—the first forty-five feet of the cleft was virtually perpendicular. Andrew Schow and Reuben Collett were sent to explorer a possible trail on the other side of the Colorado River. A few miles above the Hole-in-the-Rock opening, the two men lowered a wagon box off the cliff. Using the wagon box to cross the river, the explorers climbed up high enough to see the San Juan and Colorado River junction. Satisfied, the two men returned to Escalante and reported it could be done. 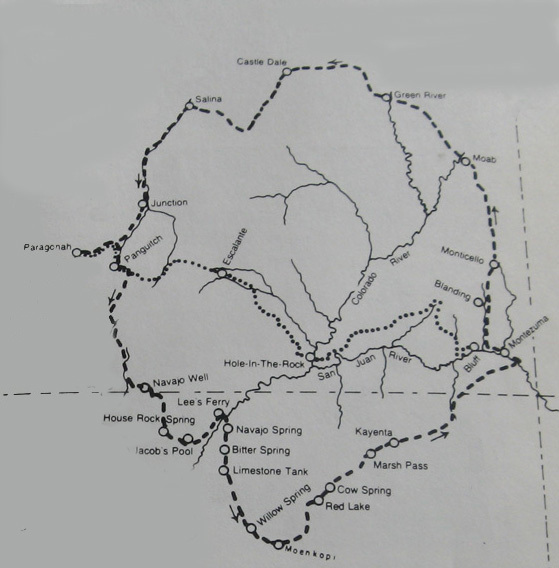 The canyon rim route was chosen because it was shorter than the northern alternative and safer than the southern route through Navajo lands. The distance from Escalante to the San Juan was estimated at two hundred and fifty miles and would require about six weeks. A missionary call to fill the San Juan Mission was issued by the Mormon Church. Settlers from Utah’s Iron, Washington, Millard, and Garfield counties answered the call, including several non-Mormons wanting safe passage to the Colorado gold fields. The members of the Church of Jesus Christ of Later Day Saints assigned to the San Juan Mission were carefully selected. The average age of the adults was twenty-eight. Wagons carried plows and seed grains—tied to the sides of the wagons were water barrels, cages of ducks, chickens, rabbits, and boxed bee hives. These settlers did not plan to return—the San Juan country was their new home. 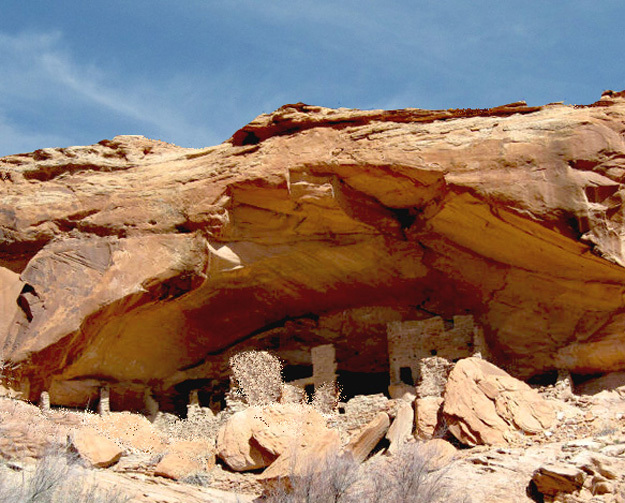 On October 22, 1879, men, women, and children started for Escalante. The wagons were pulled primarily by horses, but a few had oxen. The first company consisted of Mormons from Cedar City, with Jens Nielson the leader. Other groups joined the Cedar City group from Parowan and Paragonah. 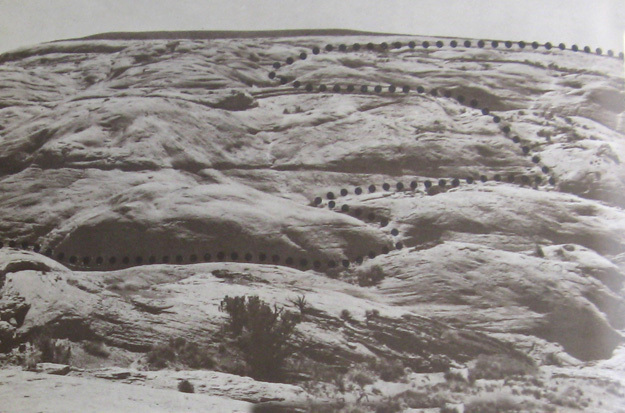 Wagon groups from various place met southeast of Escalante at Forty-mile Spring. A road would have to be built from Forty-mile Spring to the Colorado Rim. By the twentieth of November, two hundred and thirty-six men, women, and children with eighty-three wagons and well over a thousand head of horses and cattle were at Forty-mile Spring. While camped at Forty-mile Spring, dances were often held at nearby Dance Hall Rock. Jens Nielson sent four men to explorer from the Colorado River to the San Juan River. Gone a week, only one of them, George C. Hobbs, thought it was possible to continue with wagons. The other three men believed wagons could not reach the San Juan area. A meeting was held on the fourth of December, and after a long deliberation, the vote to continue was nearly unanimous. By the tenth of December, the Forty-mile camp had moved to Fifty-mile Spring. On the seventeenth of December, a scouting party was sent to Montezuma with two horses and two pack mules. Enough food was packed for eight days. By the time the party reached present-day Bluff, the men had not eaten for four days. The men were surprised to find a Mormon family there from Colorado. The Harris family was not much better off than the weary travelers. All they had left to eat was a small sack of wheat. The next morning, the explorers continued on to the Harriman and Davis families on Montezuma Creek—they were as bad off as the Harris family. Due to the heat and not being able to irrigate the semi-arid land…ditches and head gates washed out in the sandy soil. Unable to irrigate their crops, the settlers had not grow enough to feed their families. 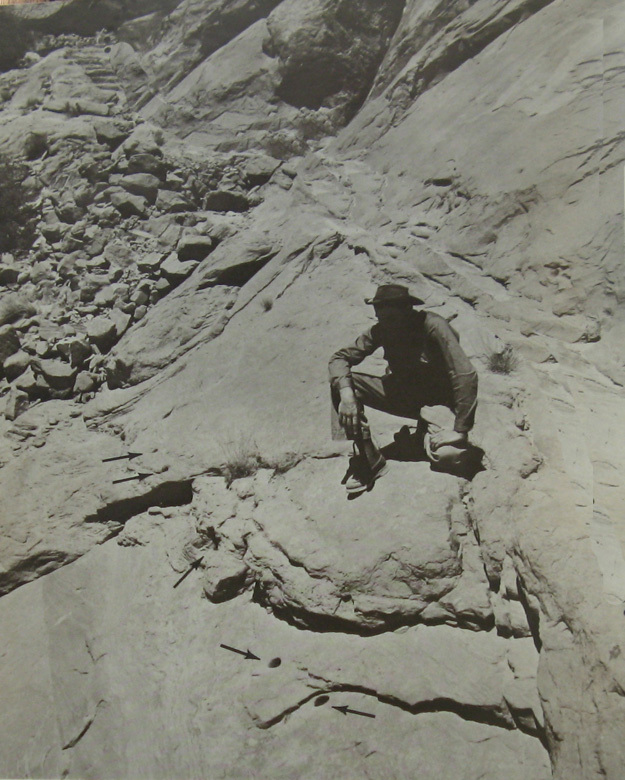 The Hole-in-the-Rock scouting party obtained forty-eight pounds of flour for twenty dollars from Peter Shirts—an old trapper that had lived on Montezuma Creek since 1877. Leaving Montezuma Creek, the party followed an ancient Indian trail around Grand Gulch. 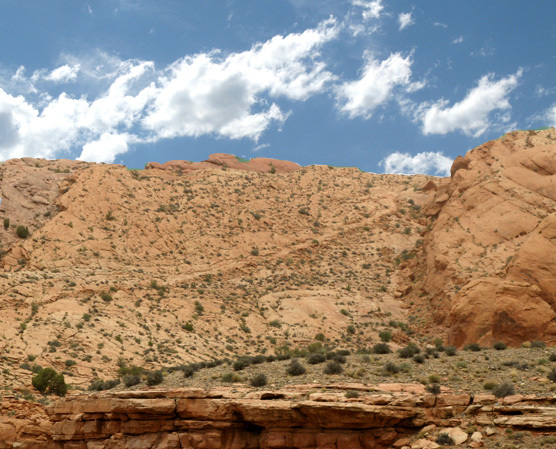 Thirty miles beyond the Grand Gulch, they climbed onto Grey Mesa—the men marked the trail with rock cairns. The exploratory party returned on the ninth of January to report a road would be difficult, but possible. The men were divided into five work groups: one to work at the crevice—one to build a road from the crevice to the river—one to build the ferry—one to cross the river and work on the Cottonwood Gulch road—another small group to herd the horses and cattle. The animals ranged up to fifty miles from the camp to find enough feed and water. Two new camp sites were established–one at Fifty-mile Spring and the other on the rim of the Colorado River. Half of the men stayed at Fifty-mile spring and the other half established the camp near the rim. While workers carved out the Hole-in-the-Rock road, Charles Hall worked on the ferry. Lumber for the ferry was cut in Escalante and hauled to the Rim—by this time, the opening was wide enough to lower and carry timber to the river. The ferry built by the Charles Hall workers was wide enough to carry two wagons with the teams at one time. A pair of oars moved the ferry across the slow water of the Colorado River.Part of the ferry workers helped the Fifty-mile camp workers build the road from the river up a two hundred and fifty foot rock bank into Cottonwood canyon. The Fifty-mile workers walked about six miles to the rim, crossed the river, worked on the road during the week, and returned on Saturday. At both camps, especially the rim camp, water was always a problem, but worse was lack of firewood. With two blacksmith forges at the rim camp, the blacksmiths kept the tools sharp for drilling into the solid rock. Standing in half-cut barrels, the workers were lowered with ropes over the rim. Dangling in midair, they drilled holes in the cliff and filled them with blasting powder. 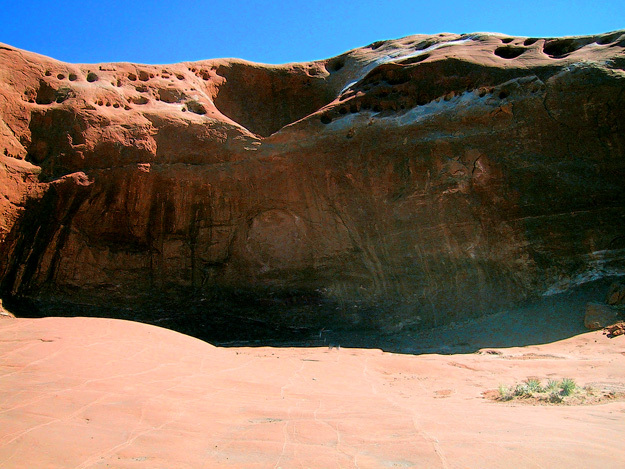 In areas of sandstone, the holes were filled with water, and when the water froze, chunks of rock broke off. Not far below the first vertical drop of forty feet was another shear wall of fifty feet. Below this drop, the workers tacked a road to the cliff wall. This section of road was called Uncle Ben’s Dugway for the Welch miner, Benjamin Perkins. A narrow ledge for the inside wagon wheels was chiseled out along the wall. Below this narrow ledge, workers drilled holes every foot and a half parallel and about five feet below the ledge. The holes were two and a half inches in diameter and about ten inches deep. Cedar stakes from Kaiparowits Plateau were pounded into holes. Covered with logs and brush then rocks and gravel, the stakes provided the support for a wagon road; with only picks and shovels, the work was slow and tedious. The black arrows point at the stake holes. With a square and level, it was determined the angle of decent for the first two steep sections varied from forty-five to fifty degrees with the overall grade off the upper portion dropping one foot for every two feet forward…or thirty-three degrees. 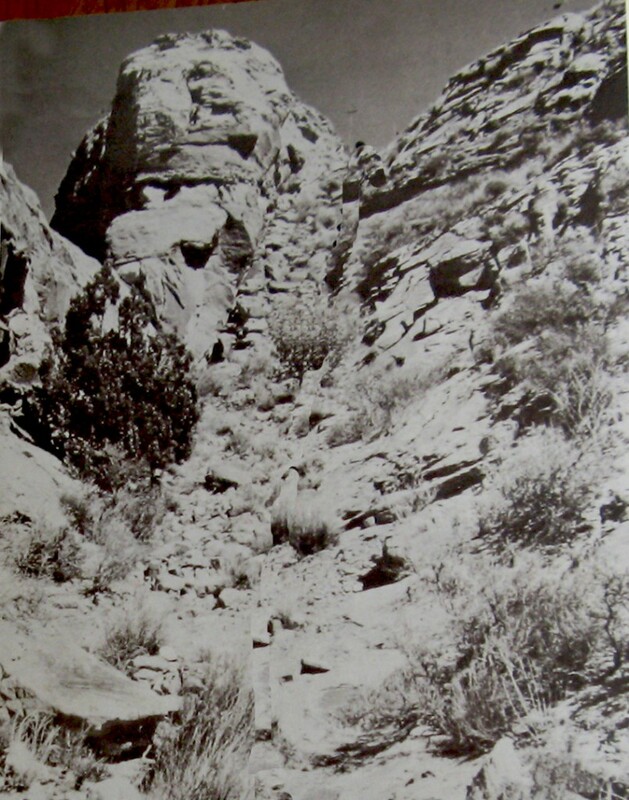 Below Uncle Ben’s Dugway, the road to the river was on a steep talus slope. On the right is the ledge for the wagon wheels. Afraid of the deep dark crevice, the wagon teams had to be forced into the slot—the first team down was a pair horses blinded by pinkeye. With the back wheels locked and up to twenty men and boys holding back with long ropes, the first wagon started down on the twenty-sixth of January. Jens Nielson’s son-in-law, Kumen Jones is generally credited with driving the first wagon down. The first 40 feet down, the wagon stood so straight in the air it was no desirable place to ride. (The) channel was so narrow the barrels had to be removed from the sides of the wagon to (let it) pass through. Twenty-six wagons went down the first day. As the wagons went down the steep slope dirt and gravel was scraped off the road. David Miller claimed a chain tied around the blocked rear wheels dug in the ground—Lee Reay claimed this was tried, but discontinued–the chain drug off to much dirt. In places, the roadbed became like a toboggan run. On the steepest slopes, horses fell and were dragged, or pushed, but none of the horses were seriously injured. When Stanford Smith went back after his wagon, no one noticed him leave. He reached the top of the gorge alone. Smith left his children on the rim and drove the last wagon down with his wife and one horse tied on backwards to help hold back the wagon. His wife and the horse were dragged down the chute for about one hundred and fifty feet. Other than scrapes and bruises neither his wife nor the horse was seriously hurt. 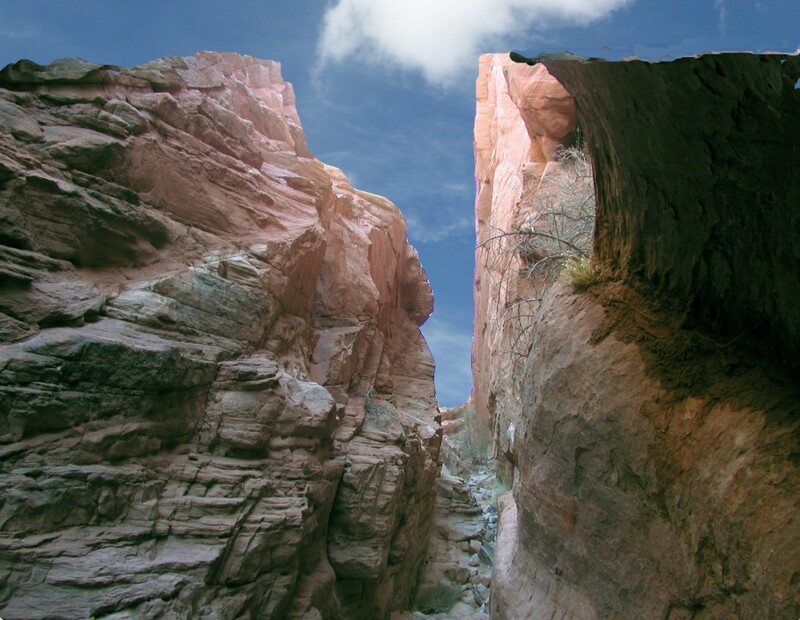 In small bunches, the cattle and horses were forced into the steep narrow Hole-in-the-Rock road crevice. One rider reported crossing the river twenty times before all of the cattle, oxen, and horses were swam across the river. By the thirtieth of January, all of the wagons had reached a level area with cottonwood trees and a good stream. This was the first opportunity for the women to wash clothes. The wagons remained in the Cottonwood Canyon camp for ten days while the road was built out of the canyon—it was still five miles to the top of Grey Mesa. By the tenth of February, the Cottonwood Hill road was ready. It took seven teams to pull wagons up the steep grade. Despite men above the road with ropes attached to the wagons, two wagons tipped over in areas with blown sand on the trail. On one wagon, a box with a hive of bees was broken. The cold lethargic bees were gathered up and put back into the repaired box. The road out of Cottonwood Canyon followed a “relatively” flat ridge before dropping into Wilson Canyon. The wagons waited on the road crews at what was later called Cheese Camp—supplies from Panguitch contained forty pounds of cheese along with two hundred pounds of pork. George Hobbs left Cheese Camp with a pack string to haul supplies to the Harris family at Bluff and the Harriman and Davis families on Montezuma Creek…Mrs. Harriman was Hobb’s sister. At Cheese Camp, the cattle owners wanted to send the cattle on ahead. This was agreed to after the herders promised to push the cattle across Grey Mesa as fast as possible—wagon owners were afraid there would not be enough feed left for the draft animals. 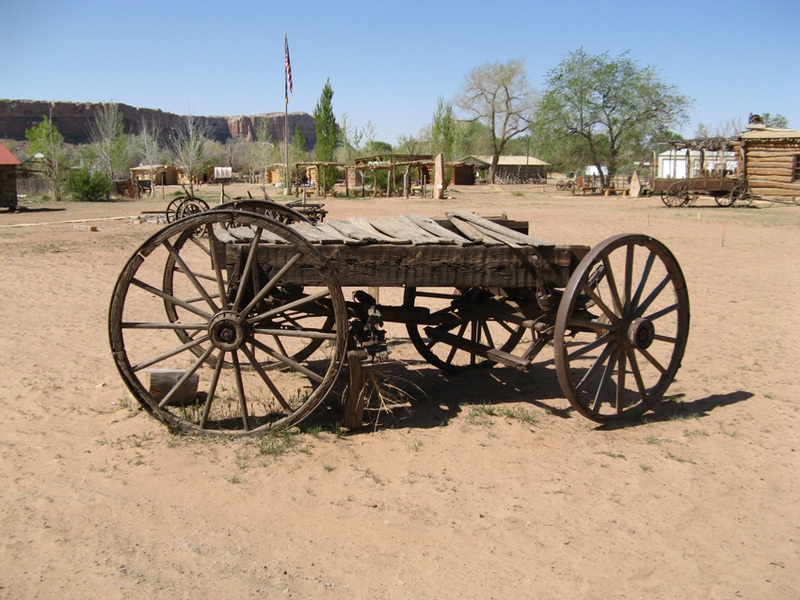 From Cheese Camp at the bottom of Wilson Canyon, the wagons started up the Chute onto Grey Mesa. From the bottom of the Chute to the top is approximately 290 feet. 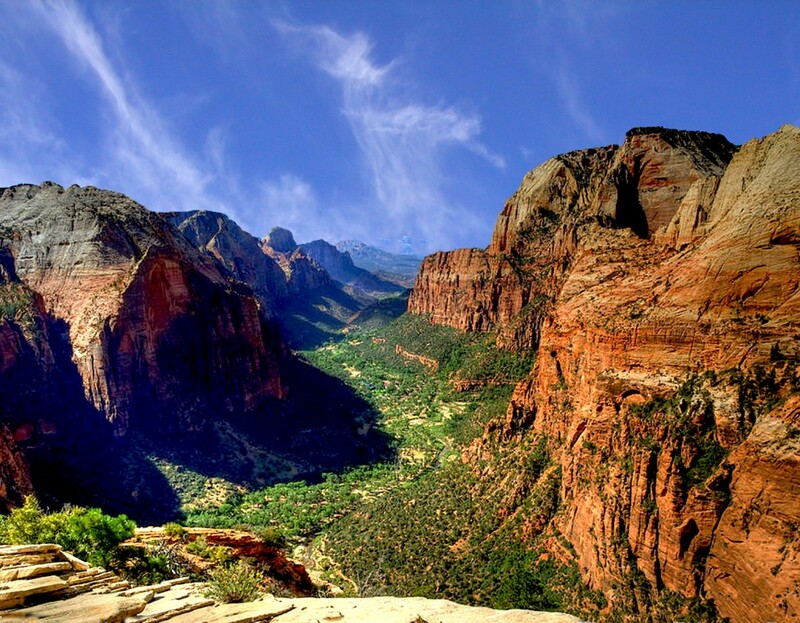 The change in elevation is 238 feet. Taken from Delorme Topo 9 software, the distance is hard to accurately measure over such a short distance. The point is it was steep…81 degrees based on the Delorme map. Sand spread on the slick rock provided better traction for the six to seven span of horses required to pull one wagon up the Chute. At the top of the Chute, a two mile ridge covered with a foot of snow led to Grey Mesa. The next two pictures are from the ridge between the Chute and Grey Mesa. The “road” across the ridge is now followed by black skid marks on slick rock. The present-day “road” is probably close to the Hole-in-the-Rock trail because deep canyons and gullies prevented going anywhere else. 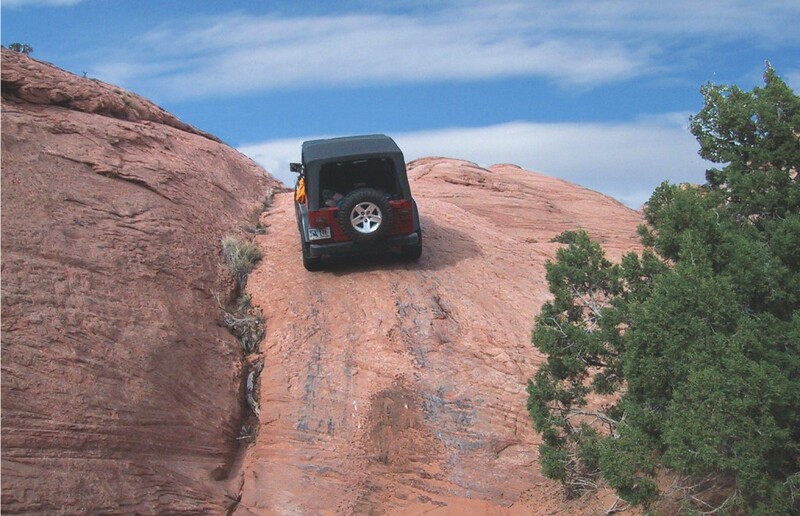 The settlers wagons crossed the sandy Grey Mesa with little difficulty until they reached a steep sandstone cliff. Workers created a series of steps and grooves to hold sand to provide better footing for the teams. The smooth, oily, sandstone surface become known as the Slick Rocks—a third of the road was carved out before road workers from Panguitch gave up and went home with the belief a road could not be built on the slick surface. Below the Slick Rocks, the wagons stopped at Lake Pagahrit. Drifting sand had blocked off Lake Canyon forming a lake behind the sand dam. The lake was a half-mile long and about a quarter mile wide with good feed around it. 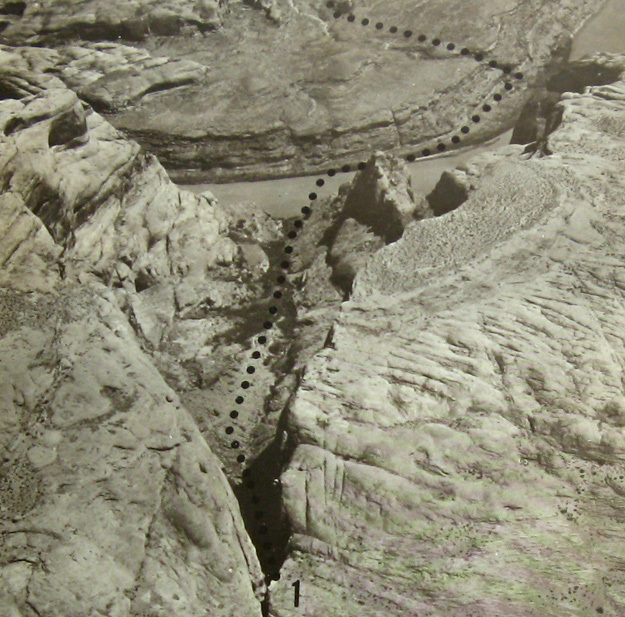 The sand dam washed out Lake Pagahrit in 1915. The lake provided a resting place for the people and grass for the livestock. The wagon train camped there several days while work crews worked on the Clay Hills Pass road. 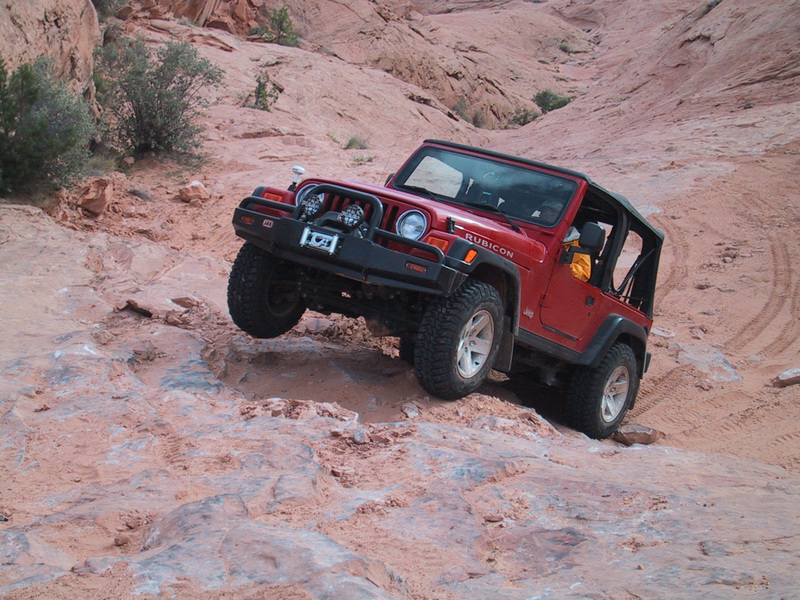 Despite the jeep pictures, it is hard to visualize the difficult terrain the pioneers faced. This next picture, although not part of the pioneer trail, helps put it in perspective. State road 261 goes across Cedar Mesa between highway 163 and highway 95. 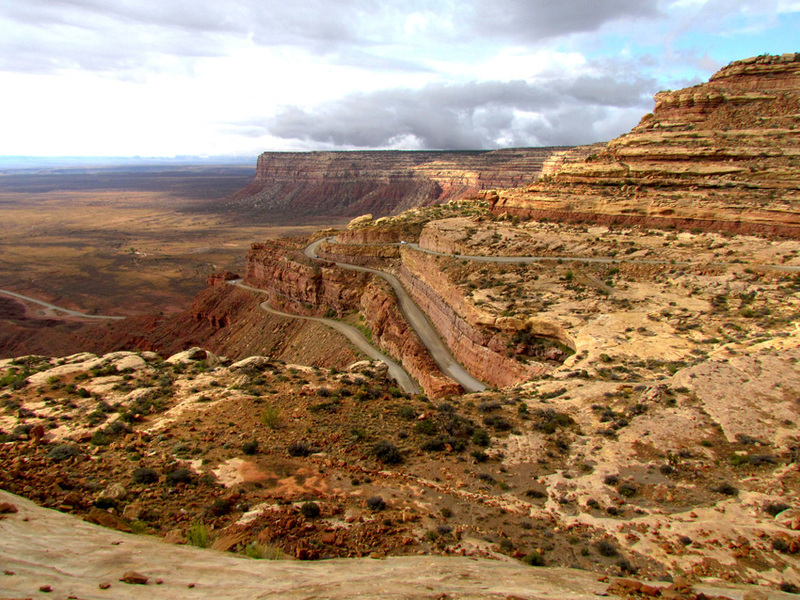 Just as the Clay Hills road did, the Moki Dugway road drops 1100 feet in three miles. 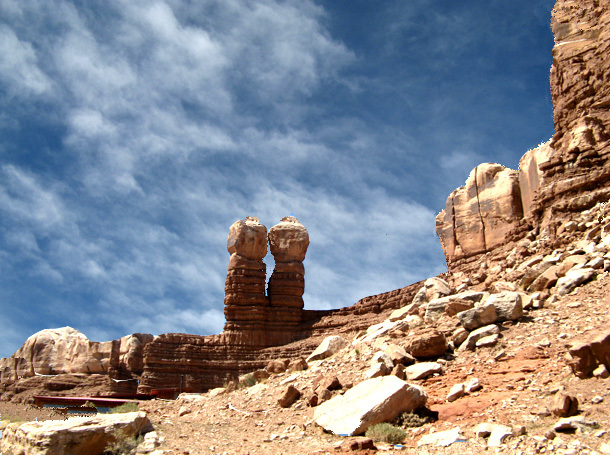 Built by a uranium company, Moki (Moqui) Dugway is southeast of Clay Hills road. The thousand foot drop off of Clay Hills Pass required a three mile switchback road. 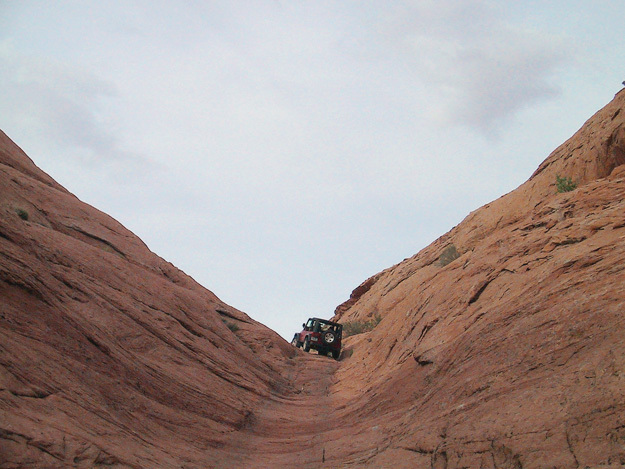 Once off of Clay Hills Pass, the trail paralleled State Highway 276 and then around the north end of Grand Gulch. 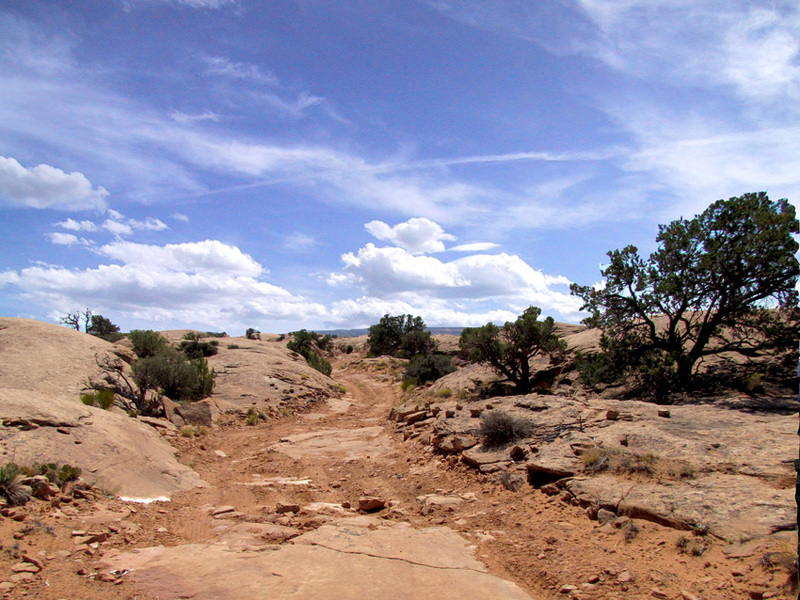 The trail proceeded east between Owl and Road Canyons…Snow Flat Road. 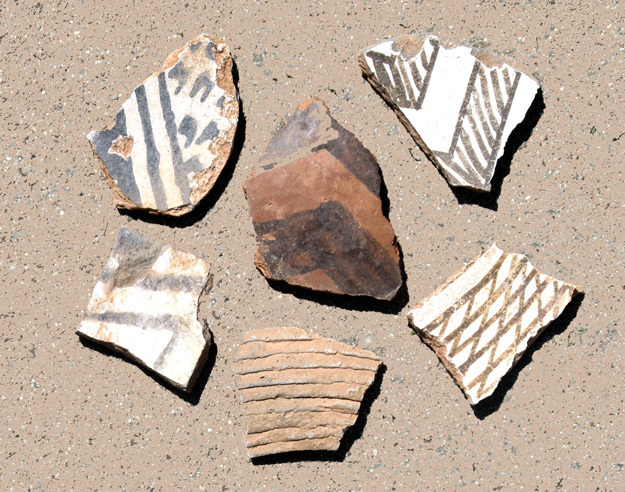 In this area were Anasazi pottery sherds and rock dwellings beneath rock overhangs. Moon House ruins are about a mile off the road in McCloyd Canyon. 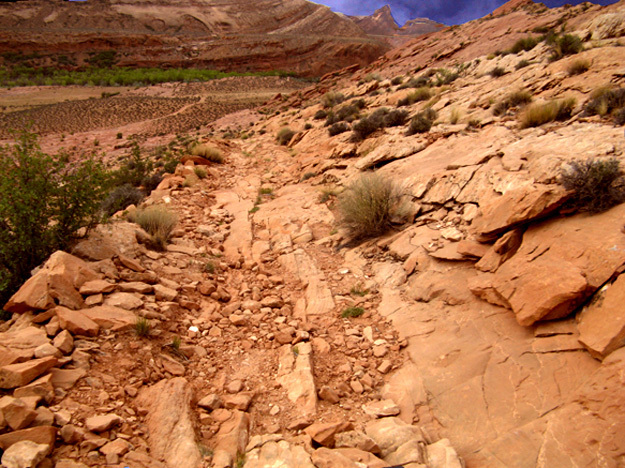 This area of the trail was washes and juniper trees that ended in Comb Ridge Wash. Wagons traveled several miles down Comb Wash before locating a place to build a road over Comb Ridge. 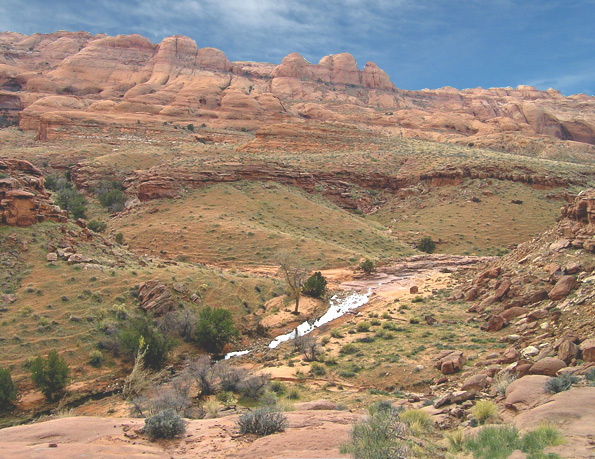 A road was built between the south end of Comb Ridge and the San Juan River. The pioneers called it San Juan Hill. Aside from the Hole-in-the-Rock, itself, this was the steepest crossing on the journey. Here again seven span of horses were used, so that when some of the horses were on their knees, fighting to get up to find a foothold, the still-erect horses could plunge upward against the sharp grade. On the worst slopes the men were forced to beat their jaded animals into giving all they had. After several pulls, rests, and pulls, many of the horses took to spasms and near-convulsions, so exhausted were they. By the time most of the outfits were up San Juan Hill, the worst stretches could easily be identified by the dried blood and matted hair from the forelegs of the struggling teams. One of Jens Nielson’s oxen struggling to get over San Juan Hill collapsed and died. The next two pictures are for those that have read the excellent historical novel of the Hole in the Rock Expedition by Gerald N. Lund: The Undaunted. 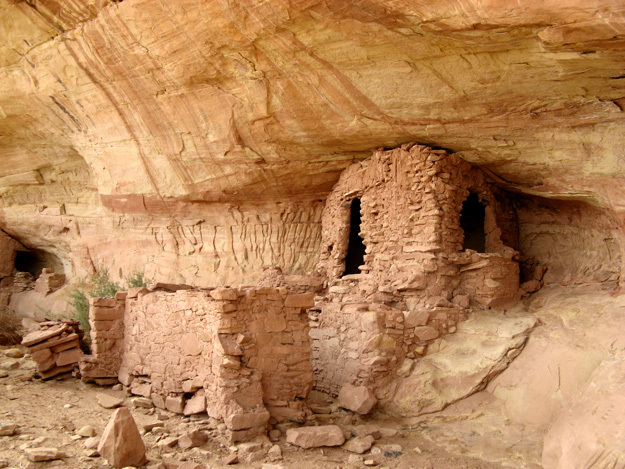 Not far from where the pioneers camped while building the road up San Juan hill at the end of Comb Ridge was an Anasazi Ruin on a ledge near the San Juan River. 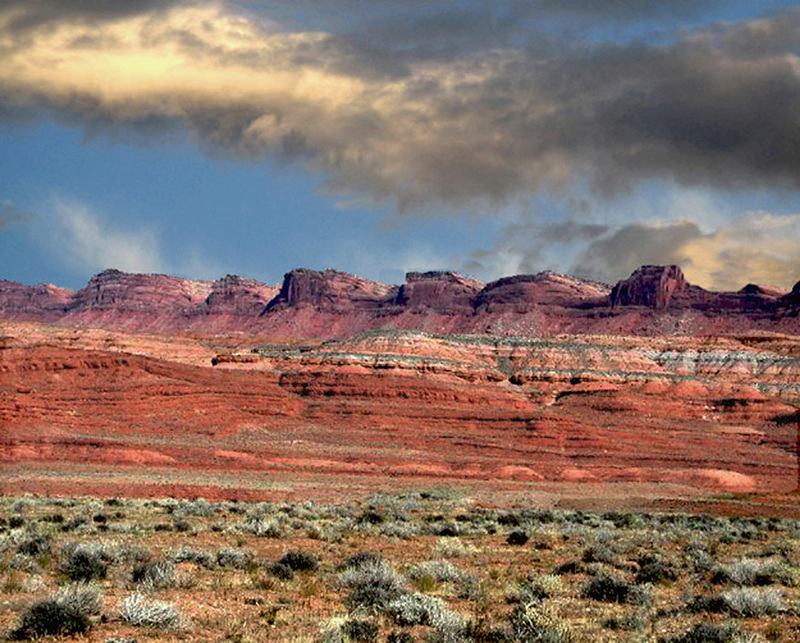 Off of Comb Ridge and across Butler Wash, the settlers reached the Bluff area on April 6, 1880. Though several miles short of the original destination on Montezuma Creek, the weary travelers wanted to go no farther. The settlers had found their new homes—a six week journey had taken six months. Remarkably, no lives were lost and two babies were born…another was stillborn. After arriving in Bluff City, Platte Lyman returned to Escalante for flour and other supplies. Westward traffic up the Hole-in-the-Rock road required each wagon to have a six-horse hitch (12 horses). The road created by this pioneer company served as the route in and out of the San Juan area for about one year. 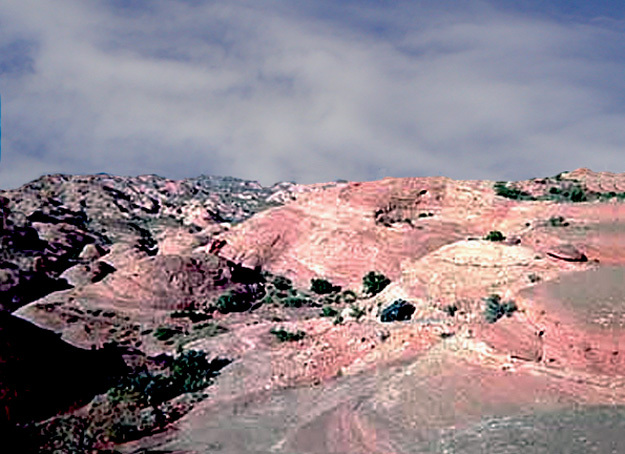 The settlement of Bluff is near the Navajo Twin Peaks. Trying to irrigate cropland from the fluctuating flow of the San Juan River was a problem, and many of the original settlers moved on to settle present-day Blanding and Monticello. In these areas, the Blue Mountains provided a reliable source of water. The Jens Nielson family remained in Bluff. Jens died in 1906 and Elsie in 1914. 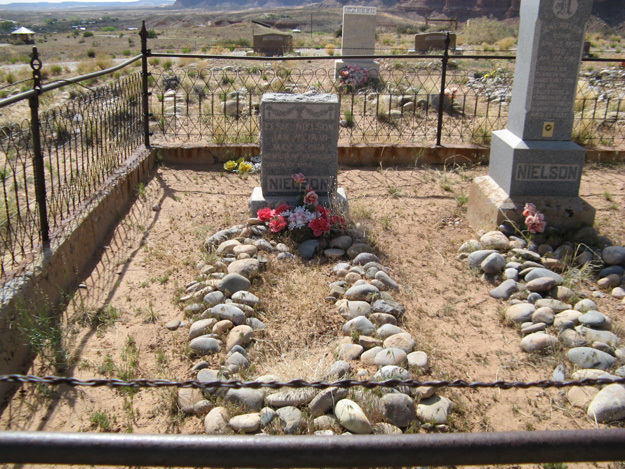 They are buried in the tiny cemetery overlooking Bluff, Utah—these Danish immigrants exemplify the driving force behind America’s western expansion. The Charles Hall family built a cabin and remained at the Hole-in-the-Rock ferry crossing. 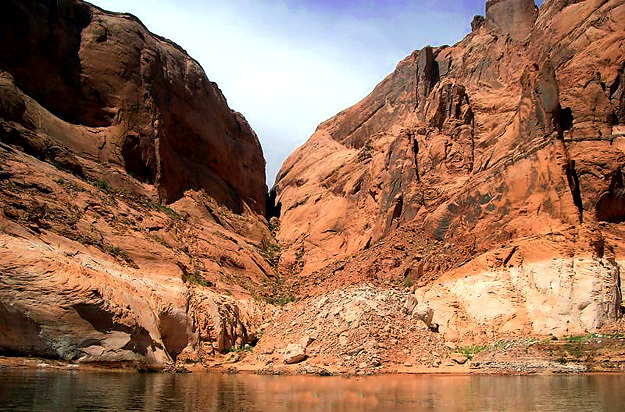 When an easier route was found from Escalante down Harris Wash to the Colorado River, Charles Hall moved the ferry upriver to present-day Hall’s Crossing on Lake Powell. Hall’s Crossing is across the lake from Bullfrog Basin. The Hole-in-the-Rock article was written by O. Ned Eddins of Afton, Wyoming. To return to the Emigration home page click on the wagon train logo. Miller, David E. Hole-In-The-Rock. University of Utah Press. Salt Lake City, Utah. 1966. Reay, Lee. Incredible Passage Through in the Hole-in-the-Rock. Meadow Lanes Publication. Provo, Utah. 1980. Personnel Communication: LaMar Helquist great grandson of Jens Nielson. First Vice-President of the Hole in the Rock Foundation. Museum at the Historical Bluff ‘s Fort Site, Bluff, Utah. – Built and managed by great-grand children of Jens Nielson.